In today’s age of rapid technological development and consumer empowerment, the face of marketing and its relationship with sales is changing. In 2014, we live in a ‘marketing first world’ where consumers hold ever-increasing control over salespeople and self-direct more and more of their buying process. To demonstrate this with a simple example, let’s rewind 20 years and look at how consumers went about buying a new TV. Just like today, the prospective buyer would have created a consideration set of brands based on their awareness from past experience, speaking to friends and family and mass company communications (advertising etc.). 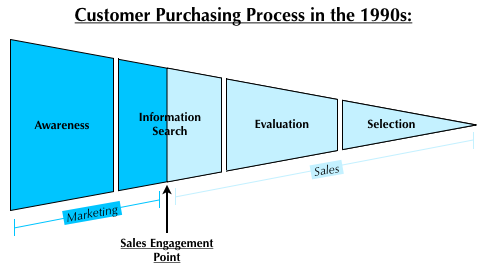 Next, and crucially early on in the buying journey, the consumer would likely have engaged with a salesperson at a retailer, such as Curry’s electricals, to gather more information about these and other TV brands – therefore creating an opportunity for salespeople to significantly influence the selection process and purchase decision. Who would of believed in the early-90s that search engines would today be the start of the sales cycle for 89% of buyers and that 81% of online customers would trust a complete stranger’s review? The truth is, there’s so much more opportunity for consumers to do their own research which is ideal because we hate being sold to! Even if a prospect does end up buying in-store (as opposed to online), they will arrive prepared with knowledge on a few products in greater depth than any salesperson themselves could have about their whole portfolio. In this whitespace, a new challenge has arisen for marketers to continue nurturing prospective buyers beyond the point of information search by utilising the vast array of information sources now available. 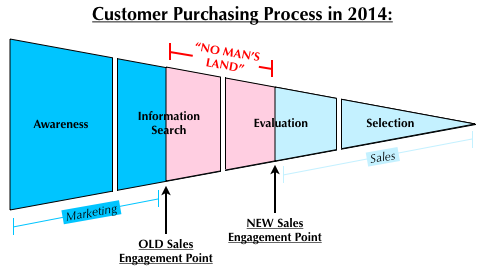 However, given this new hands-off approach from sales, tracking and managing the journey has intensified. More and more customer touchpoints creates greater confusion as to what actually works in pushing customers along the buying journey – all this at a time when pressure on marketers to deliver strong return on investment is greater than ever. What sources are most effective and so should receive sufficient investment? Marketing automation answers this question. Marketing automation is a form of technology that allows companies to streamline, automate, and measure marketing tasks and workflows. Collating all communications into a single system allows for retrospectively understanding what touchpoints influenced eventual customers, and at what point of the buying process (particularly for long term, high involvement purchases). It may be that 60% of purchasers visited the company website, meaning it must be up to scratch and driven by quality content, as opposed to social media which may only directly influence 5% of eventual customers. More than this however, marketing automation helps eliminate the typical ‘batch and blast’ approach to communications by most companies, instead building one-to-one personalised conversations based on behaviour. Tracking the precise individual journey of each prospect means that companies can react to specific actions, such as a fashion retailer following up a customer defecting from its website with a 10% voucher code delivered by email. The benefit of this is demonstrated by research that shows a 60% greater open rate for automatic trigger emails compared with batch emails and a 130% better click rate. One sole article does little justice to the complexity and importance of marketing automation. Nevertheless, with the adoption of marketing automation technology expected to increase 50% by 2015, and with 63% of companies who are outgrowing their competitors using the software, this certainly won’t be the last you hear about marketing automation. This entry was posted in Communications and tagged Awareness, Communications, Customer Buying Journey, Evaluation, Information Search, Marketing, Marketing Automation, Sales, Selection. Bookmark the permalink.